Ten miles from downtown Auburn, inside the Little Texas community of Alabama, is a long stretch of dirt road and at the end of that road are two curly-headed, muddy-faced brothers at the aged 6 and 2 along with their 1-month-old baby sister growing up on a farm. The parents of these kids are Auburn University alumni, Josh and Beth Hornsby. 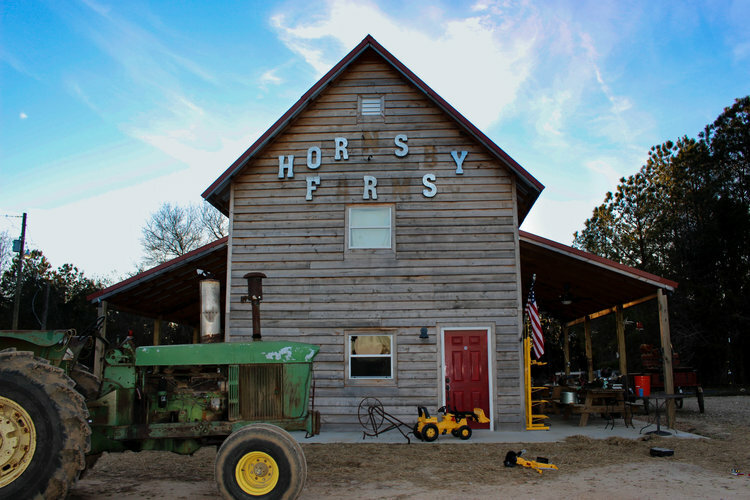 For three years, they have owned and cultivated nearly 300 acres of land called Hornsby Farms. To the Hornsbys, it is fundamental for them to teach their kids from a young age the importance of farming locally and working hard to produce a quality harvest and products from their farm. Beth brings her children out to the farm every chance she gets whether it is to spend the night in the loft above their barn, ride their miniature four wheelers around the muddy gravel or try to help Josh as he works to fix irrigation issues or build fences. “Being able to share in the joys and hard work with our children is instilling in them a great work ethic. Watching them learn how things grow, how equipment works and seeing it all click is something we love seeing,” Hornsby said. It really is a family affair for Hornsby Farms. When the weather is warm and school is out, the oldest son, Sully, enjoys picking vegetables and helping Beth at weekly markets they attend. At these markets, they set up a booth that is a representation of their farm. They not only have fresh vegetables, but also handmade soy candles with aromas of familiar farm smells of pine trees and honeysuckle vines, pepper jellies, pickled vegetables, beeswax skin care products, granola, t-shirts and sweet jams. “We get to meet a lot of great people at markets and events, and it is so much fun connecting with our community and people who love fresh local foods,” Hornsby said. Marlee Moore is an Auburn University senior majoring in Agricultural Communications. Moore knows the Hornsby family and is persuaded to bring home some jam by her roommates whenever they find out she is making a trip to the farm. Through going to these different markets and even setting up their own shop inside of their red-roofed barn, this family has been able to generate business through returning customers and restaurants that are eager to utilize their crop in recipes. Eating and buying locally is something that is a priority at Hornsby Farms. “When people choose to buy from one of these farms, like ours, they are supporting a local family. Farmers work very hard to provide foods for their community and by supporting them, you are helping them support their own family and allowing them to grow their farms to be able to help others in the community,” Hornsby said. “It is very important for us at Acre to provide our guests with the freshest ingredients possible. There is nothing like creating, preparing and serving a dish with produce that has been harvested that very day,” Christin Bancroft, director of marketing and special events, said. For Auburn students, there are many options through on-campus dining for taste testing some of produce from Hornsby Farms. Glenn Loughridge, director of campus dining, strives to find local businesses and farmers with whom to partner in order to aid in economy, sustainability and the overall flavor of food. Whether it is visiting the farm for a canning workshop with Beth or stopping in the Wellness Kitchen or Acre restaurants to experience the products, to the Hornsby family, the most important thing is getting to know their customers and expressing the value of eating fresh, locally grown food.